Education in the second largest country in the world – Canada, is considered to be a high priority of the government. Canada has a state-run system of education that is funded and administered by federal, provincial and local governments. Each province manages jurisdiction of the public education system and its curriculum, so there are some slight differences between different provinces that include the minimum and maximum age of students and types of programs offered. Though there are some slight differences, the similarities far overweight them. Education system in Canada is divided into 4 main stages: pre-primary education, primary education, secondary education, and post-secondary or tertiary education. Compulsory education in Canada in every province except for Ontario and New Brunswick is provided for students up to the age of 16. When it comes to Ontario and New Brunswick, compulsory are is 18. The academic year generally consists of 190 school days. It starts in September and lasts until the end of June. Most Canadian education systems include 12 grades, except for Quebec system that consists of 11 grades. According to the latest statistics, about 90% of Canadians have a high school diploma and 1 in 7 Canadians have graduated from university. It is worth to mention that the changing labor market that requires people to have a high school diploma or university degree to become demanded specialists highly influenced the ratio of high school graduates versus non-diploma holders. It means that with the course of time, higher education in Canada becomes more and more popular. Pre-primary education in Canada is offered to children of 4-5 years old. Though most of the jurisdictions offer one-year of public pre-primary education, there are some exceptions. For example in Quebec, Ontario, Manitoba, Saskatchewan and Alberta additional years of free preschooling are offered. When it comes to jurisdictions that offer just one year of pre-schooling, parents can send their children to a private school where children will be prepared for the elementary school that starts at the age of 6. Nevertheless, in the most jurisdictions, public pre-primary education is aimed to children who turn 5 years old by a certain date in the school year. Though in the most jurisdictions pre-primary education is optional, there are exceptions. In Nova Scotia and New Brunswick, pre-primary education is mandatory. Different pre-primary schools, known in Canada as kindergartens, offer programs of various intensity. There are schools that offer full-day programs, some offer half-day programs, and some can offer both. The curriculum in kindergartens includes learning the alphabet, gaining basic pre-reading and mathematics skills, music, art, and play. Though such programs are far from rigid, the main aim of any pre-school is to prepare a child for success at the next level of education – primary school. Pre-primary schools are aimed to teach students how to participate and act within the group, as well as how to cooperate with both teachers and classmates. Primary Education in Canada is compulsory for all children who reached the age of 6-7 years. Pre-primary education consists of six grades. It means that the students of the 6th grade are 11-12 years old. Usually, students in the primary grades have one teacher. All the subjects in primary school are taught in a single classroom. The curriculum includes such subjects as mathematics, reading, language arts, social studies, history, geography, science, music, art and physical education. It is worth to mention that when it comes to language arts, the majority of programs are focused on teaching English. Nevertheless, in Quebec, the first language if French, so the primary education in Quebec includes learning of French, not English. With each passing grade, the curriculum mentioned above becomes more difficult as students need to learn to master new skills. Secondary education in Canada is divided into two levels: junior high school and high school. Junior high school starts when a student completes the 6th grade of primary school. The junior high school consists of two years that include the 7th and 8th grade. At the age of 12-13 students study at 7th grade that introduces them to the process of attending different classrooms through the school day, as well as attending classes with different teachers. The teachers at the high junior school are considered to be the experts in the subjects they teach and must obtain single-subject certificates that indicate the expertise. The main aim of the junior high school is to prepare students for the next level – high school and postsecondary education. Most of the subjects are similar to primary school but the difficulty increases substantially. Also, there are some new subjects in the curriculum, such as foreign language instruction. Except for Quebec where the second language is usually English, students start to learn French or Spanish languages. High school education starts when students successfully complete the 8th grade. High school program consists of 4 years and involves students from the age of 14-15 to 17-18. The whole school education in Canada usually consists of 11 grades, except for Ontario where students can spend 5 years at the high school. Usually, the 5th highs school grade is referred to as Grade 12+. It is interesting to know that compulsory education in Canada involves students from the age of 6-7 to 16. Nevertheless, in such provinces as Ontario and New Brunswick, compulsory education lasts until the age of 18. The curriculum in high schools requires students to gain skills that will help them to succeed vocationally after the graduation or to get ready for college or university entrance exams. Each province in Canada provides students with a variety of programs, including vocational and academic programs. In some jurisdictions, students are able to attend dual credit courses that allow they to get both high school and postsecondary credits. After a student graduates from a high school, s/he can apply to the college or university. Colleges in Canada are usually technical, applied arts, or applied science schools that provide graduates with vocational certificates, diplomas, and associate degrees. Some students study in college to get prepared for a trade. After they get a diploma or certificate, they are able to pursue employment opportunities. Nevertheless, there are many students who study in college to get prepared to university education. In college, a student can gain a transferable credit that can be applied once a student enters university. 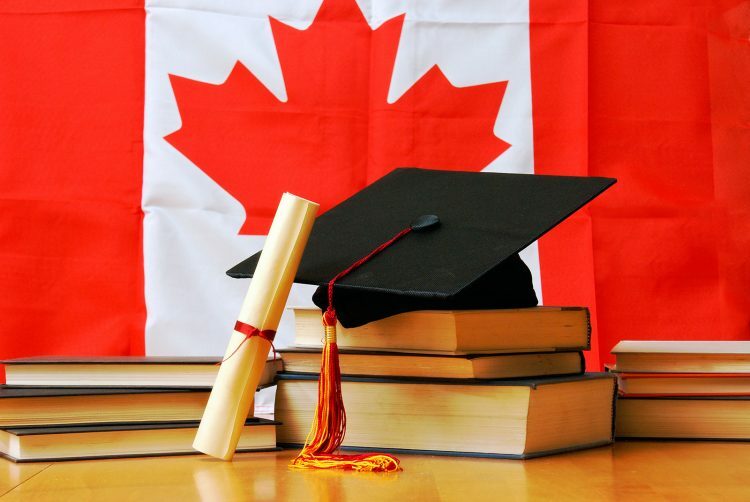 In order to get an academic degree in Canada, students apply for universities that provide them both with undergraduate and postgraduate education. The degree structure at Canadian universities is consists of 3 degrees: Bachelor’s degree that mainly takes 4 years to complete, Master’s degree that take 2 years to complete, and Ph.D. degree that can take from 3 to 6 years to complete. In Quebec, post-secondary education begins when a student enters a college. In order to be admitted to University or a vocational professional program, a student has to complete two or three-year general program provided by colleges. It is interesting to know that usually, bachelor’s degree in Quebec takes 3 instead of 4 years to complete. Nevertheless, if a student does not have a diploma from a college, an additional year of coursework is applied. There are many private vocational and technical schools, as well as apprenticeship programs in Canada where students can learn a vocation or trade. Though in prior years there was no need to get a high school diploma to attend a trade or vocational program, the requirements for most of the vocational programs now require students to graduate from secondary school prior to enrollment. Apprenticeships are aimed to provide students with the skills they need for a given trade. Apprenticeship training means that the student will work hands-on in that environment under a qualified supervisor. It includes a contact between an apprentice and an employer in order to provide the apprentice with training and experience for a trade in particular area or field. Depending on the type of the program, it can take from 2 to 5 years to complete it.